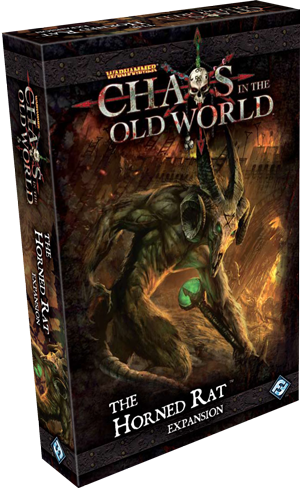 FFG has announced their plans to release an expansion called The Horned Rat for the game Chaos in the Old World. You can learn more at their site but the meat of the expansion is the addition of the Skaven to the game as a 5th player. I really like Chaos it's a good game that doesn't see enough table time but I'm not sure a 5th player was needed. The board as it is feels pretty tight with 4 players. The expansion adds new cards for the existing races and what they are calling "expert" level old world cards.